Following a friendly honk, a green truck pulls up outside South West Meals on Wheels in Carnegie at about 9:30 a.m. Then, it backs through the parking lot, right up to the kitchen door. Scott Marshall, 41, jumps out of the cab. His bald head is complimented by a large beard — grown after he left his last job as a bartender. Overall, he’s spent 25 years in the food industry, from working on his family farm to busing tables. Marshall now works for 412 Food Rescue, a Pittsburgh-based charity dedicated to saving food for those who need it most. As he passes down cases of ripe bell peppers with missing stems and sea salt brownies in dented packages, Marshall is crestfallen. “We have plenty of food, the problem is getting it to the right people,” Marshall said. To haul the food to the places it’s needed, 412 Food Rescue needs big data, logistical know-how and a lot of individuals’ altruism and energy. By bringing all three together, the organization has saved more than 700,000 meals worth of food — with a cash value of more than $2 million — for those who need them most. The plan is simple. Take food that can no longer be sold from stores, but is still completely edible, and bring it to the soup kitchens, homeless shelters and housing projects where people can’t afford their daily bread. According to a 2012 study from the National Resource Defense Council — an environmental advocacy group — about 40 percent of food produced in the United States is wasted, even though 50 percent of land and 80 percent of freshwater use is dedicated to feeding the country. “What’s the point of producing all this food if we’re throwing 40 percent of it away?” Marshall said. Trying to make sense of that question, Marshall’s day started about an hour and half before the drop off in Carnegie, behind a strip mall with a Subway and payday loans service in Millvale. He parked his yellow Jeep there at 8 a.m., next to 412’s truck in a small parking lot off a tight cobble stoned alley. A digital reader showed “37 degrees,” which could easily have been the outside temperature. It was actually measuring the refrigeration unit in the back. Sorting through the salvaged sustenance — abandoned by previous owners because they could no longer profit from it — Marshall was astonished. His origins on a small family farm in northern Indiana County helps him appreciate how much water, sweat and soil is wasted with every slightly bruised apple thrown in the trash. “We’ve been trained to only buy the perfect piece of fruit,” Marshall said. Marshall’s truck is the latest vehicle for social activists across Pittsburgh to tackle the issues that bug him. According to Jennifer England, the non-profit’s program director, 412 started in early 2015. Workers were doing rescues with their own cars rather than the 5-month-old truck. The 48-year-old Greenfield resident and Pitt alumni — she received a master’s degree in 1997 — joined 412 after it was founded by Leah Lizarondo and Gisele Barreto-Fetterman. The pair got the idea while picking up a fluke order of mislabeled — and thus, unsellable — food at a Costco for Braddock’s Free Store 15104, a store where shoppers can walk out with whatever they want, free of charge. Food gets pulled from the shelf for multiple reasons — it might have broken or dented packaging, be blemished or bruised or be nearing its sell-by date. In the last case, speed becomes a necessity for the charity. “If [the food has] a shelf life of 10 days and you’re picking it up on day five, by the time it gets to somebody’s dinner table, it’s done, you’re out of time,” England said. To aid the task of quickly moving the unwanted food from places ranging from Gordon Food Service to Trader Joe’s to Bruegger’s Bagels to food pantries and charities, 412 uses full-time employees — including Marshall and England, who are paid — and volunteers, including Pitt’s Food Recovery Heroes. The organization’s main tool is the truck that Marshall drives, donated to 412 by numerous philanthropists including Pirates star Andrew McCutchen — whose jersey number 22 graces the doors on both sides of the cab. As one of two drivers, Marshall crisscrosses Pittsburgh to pick up and drop off whatever food is available that day, fielding calls and changing course as new reports come in. That ad-hoc style defined 412 for much of its early existence according to England. “I’d love to tell you that we sketched out a smart business plan with all the logistics set in stone, but really we just dove right in,” England said. But now, with the aid of Google Docs, a portable scale and an iPad, Marshall keeps track of each pound of food he unloads. The organization keeps the information to show its work and attract new donors. As of September 2016, 412 has rescued 853,054 pounds of food. England mused that they had probably passed a million pounds of rescued food by Dec. 8, as their deliveries have increased exponentially. “We were not getting 100,000 pounds a month until around July,” England said. Tech has helped that growth. The charity recently launched an app that notifies users of small food rescues — for example, six cases of prepared meals and three bags of rolls in Oakland — near them. The user than can pick up the food and deliver it to an address supplied by the app. The bigger food rescues — sometimes thousands of pounds worth — are handled by Marshall and the truck. 412 doesn’t hold onto the food they rescue. According to England, their goal has always been to work with perishable food, which also tends to be more nutritious. That means whatever Marshall puts in the truck must find a new home before his day is done. As he starts to unload the truck in Carnegie, Mari Murphy, from South West Meals on Wheels, comes out to meet Marshall with some her fellow volunteers. She combs through the truck, sliding boxes of food she can use — like some packaged lemon and rosemary chicken from Trader Joe’s — to prepare for those who can’t cook for themselves. Murphy knows that all the food is still edible — as long as she’s quick. She’ll turn around most of it into meals within the next few days, so she only grabs what she is short of. The day Marshall stops by, she’s making an egg bake with whatever she had lying around — some peppers and onions mostly. It’ll be delivered within the hour. After leaving Carnegie, Marshall drops off the last of the unprepared food at two public housing locations for their food pantries and for residents to shop through. 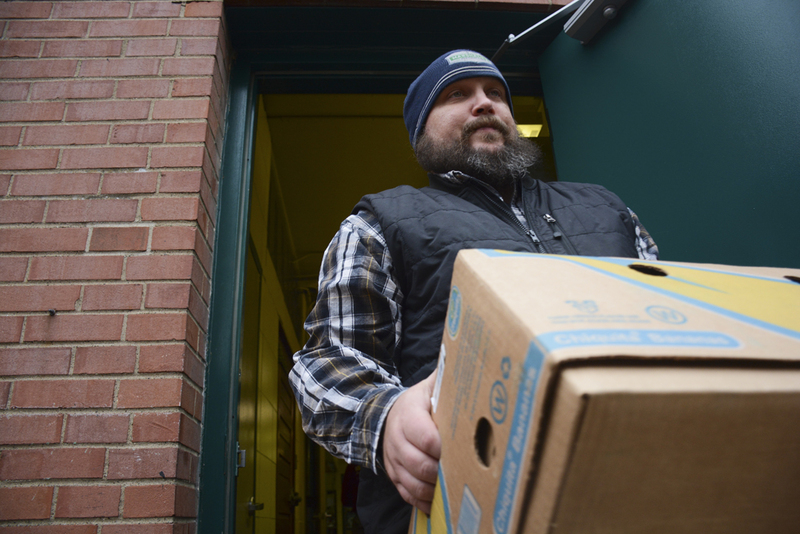 With a truck filled only with some apples, tangerines and pastries, Marshall crosses the Liberty Bridge into Downtown to drop off the ready-to-eat food at St. Mary of Mercy’s Red Door Ministry. Run by Heidi Potter, the ministry serves lunch to the homeless out of a little open window next to the namesake red door. Marshall’s stops are one of the few consistent donations that Potter receives, which makes his face, red from the cold, a welcome sight. His day done, Marshall hops back in the truck and drives back to Millvale. Though his time is split between 412 and responsibilities at the family farm, Marshall can’t see himself ever disengaging from his food recovery work. After all the good fortune he’s had in his life, he said he’s pulled to offer a taste of that luxury to others.